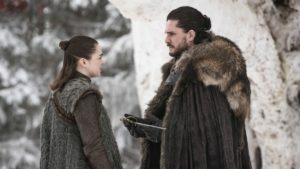 Game of Thrones begins its final season with an episode full of reunions, callbacks, and some momentous revelations. The board is being set for the gigantic battle against the Night King as characters struggle with tense allegiances and painful truths. While light on the action, this episode still gave us so much to unpack, not least in some well-earned and long-awaited character interactions. 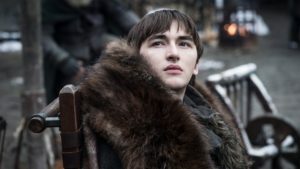 Bran the all-seeing declares, in an amusingly meta way, that there isn’t any time for politics as he reveals to Daenerys that the Night King has her dragon and that the dead are on the move. 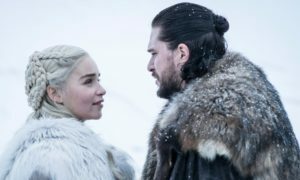 But it is still difficult for Jon and Dany to rally the troops of the North, given the people’s distrust of foreigners. Many Northerners, including Lyanna Mormont (I hope we see her and Jorah interact at least once this season!) feel betrayed that their chosen king bent the knee to the Targaryen queen. The most powerful moments of the episode really were the Stark reunions, with Jon’s hug and forehead kiss for the stoic Bran, to the epic and emotional reunion with Arya in the godswood. As moving as Sansa’s reunion with Jon was in season six, Arya and Jon meeting each other after years was truly an experience, given how close they had always been as children. Their deep love for each other had never wavered and though they both had endured hell (in Jon’s case, he had literally died), they found their way back home. When Jon is surprised that Arya is taking Sansa’s side, the former reminds him of the bonds of family. The Stark sisters have shown solidarity before, and they will support Jon if all this trouble in the North can be sorted out. Sansa said that she has faith in Jon but she doubts Daenerys for now. Some other memorable reunions were also with Arya such as her fun moment with the Hound (giving the closest he will ever get to a smile of approval) and then that cute (and also long-awaited) moment with Gendry! And she asked him to forge her a weapon though what that will be is still unclear. I also really enjoyed Sansa’s reunion with Tyrion, as they reminded each other that they had last spoken at Joffrey’s wedding, which, as Sansa noted wryly, “had its moments.” Had Tyrion returned under different circumstances (and not supporting a foreign queen), one suspects that Sansa might have been a bit more welcoming. 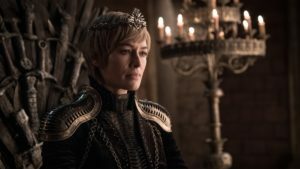 But while she has enough respect for her former husband, she expresses her disappointment in his trusting Cersei’s word by witheringly saying she “used to” think he was the cleverest man alive. While most of the episode was set in the North, we had to check in on King’s Landing for a bit. Euron Greyjoy brought Harry Strickland and his men from the Golden Company to fight for Queen Cersei. In a rare moment of levity for Game of Thrones, Cersei expressed her disappointment that there were no elephants. Euron again asserted his desire to bed the queen and though she rebukes him at first, she makes a calculated move of allowing him into her bed, if only to legitimize the child in her womb. Since Game of Thrones will only have five episodes left, the writers seem determined to cram in as much plot as possible and some sections feel extremely rushed, like Theon’s rescue of Yara and then subsequent decision to return to Winterfell to fight. There were also a few scenes confirming that Tormund and Edd survived the fall of the Wall, but they had to see the gruesome message from the Night King, the reanimated corpse of young Ned Umber giving us a truly chilling moment on Game of Thrones. One light and glorious event, and probably one of the last happy moments they will have together, was Dany and Jon going on a dragon flight. Jon was visibly nervous as he clung to Rhaegal while Dany looked proud and happy to be sharing a connection with him. There was that slightly corny cave scene (oh, Jon, what a way to honor Ygritte’s memory) but the dragon flight really was one of those spectacles Game of Thrones always delivers with aplomb. Another unexpected interaction that turned into something tragic was Daenerys meeting Sam for the first time. The scene started out positively as Jorah had told Dany about Sam saving his life. Sam was honored to meet the queen and looked as flustered as can be expected. But when he tells her his last name, Dany realizes with horror that some of her reckless actions in the pursuit of power may indeed have sad consequences. 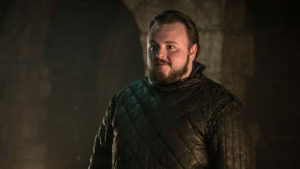 It was a painful scene to watch but one that John Bradley portrayed masterfully, showing the subtle change in his reaction to learning about his father’s death and then about his brother’s, both on Dany’s orders. One can see how his heart broke even as he struggled to maintain his composure. All this led to that momentous reunion between Jon and Sam in the crypts of Winterfell, one that gave Sam the opportunity to reveal Jon’s true parentage. This is a huge development in the story and one I did not expect to happen this early in the season. But, there is no time to waste, and it is for the best that the truth about Aegon Targaryen be out so that everyone else can deal with the consequences. Jon is clearly shaken by this revelation, appalled that the man he had called father had lied to him all his life, and also fearful about how Daenerys would react to this knowledge. But Sam does make a good argument for Jon’s leadership, having been witness to his friend’s mercy even to wildlings, while keenly aware of Dany’s harsh treatment of those who would oppose her. The North has less reason to trust her now but with the White Walkers marching south, more than ever will they need to stand together and fight. The board is set and the pieces are moving.